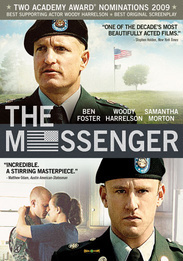 Another movie about Iraq, The Messenger is a moving, wonderfully acted drama that looks at the effects of the Middle East conflict on the homefront. Ben Foster plays a war hero reassigned to act as a Casualty Notification Officer. His job is to alert families that their loved ones have been killed overseas, and he’s partnered with Woody Harrelson, a recovering alcoholic lifer who teaches him the military etiquette required for this most difficult assignment. The camaraderie that develops between the two men — often solemn, sometimes lighter — comprise the most powerful moments of the film. They use their friendship to carry out their orders, quietly telling civilians about the fate of their fathers, sons, and daughters. And in some cases, the victims’ families are played by recognizable actors, like character actors Steve Buscemi or Peter Friedman. First-time director Oren Moverman (he wrote the Dylan pseudo-biopic I’m Not There), working from a script he penned with Alessandro Camon, knows how to get under the audience’s skin and into their emotions by keeping the grievous soldier-family civilian confessionals simple but direct. It’s only during the final third of the film that the proceedings flag a bit, as the Foster-Harrelson friendship takes a backseat while Foster attempts to get romantically interested in a recently widowed woman (Samantha Morton), an act forbidden when it comes to soldier decorum. Nominated for two Academy Awards, The Messenger failed to win an audience when released in theaters, a familiar instance of filmgoers overlooking a fine effort about the troubling Iraq War. In a perfect world, The Messenger will redeem the apathy it received in its theatrical incarnation, but as this forceful, provocative film attests, we are living in a world that’s far from perfect. The DVD comes with plenty of special features that go behind-the-scenes of the making of the film.